“Upstart Crow is a knockabout, well-researched take on the working and domestic life of Shakespeare, which fudges his timeline to allow scenes in both Stratford-upon-Avon with his family, and with his theatrical muckers in London … Even if your knowledge of Elizabethan domesticity is scant, Elton’s new family sitcom is a return to jokes and I welcome that with ye knobs on.” — The Guardian. “Written by Ben Elton? Check. Tudor setting? Check. Studio sitcom? Check. Comic reworking of well-known plots and tropes from English history and culture in an elaborate script peppered with wordplay? Check. Check. No wonder Upstart Crow is being discussed in the same breath as Blackadder. Ben Elton, the writer of both shows, is clearly returning to his strengths. And I would say this does indeed deserve comparisons with Blackadder because it is very good.” — Radio Times. “Honestly, I was a bit unsure in the opening scenes. The ha-ha lines felt a bit heavy-handed at times and the studio laughter a bit too uproarious. But I loved Blackadder and I think this will feel familiar to other fans of that series. By the end of the first episode, I’d laughed, warmed to the characters and didn’t notice the studio laughter anymore.” — The Dominion Post. “Elton’s decision to write Shakespeare as an anxious, class-conscious, self-made creature (‘In England I’m afraid it’s not what you know, it’s what dead farmyard animals you rogered at university’) makes a useful historical point as well as playing to the juvenile strengths of his Eighties comedy. But this is no Blackadder. 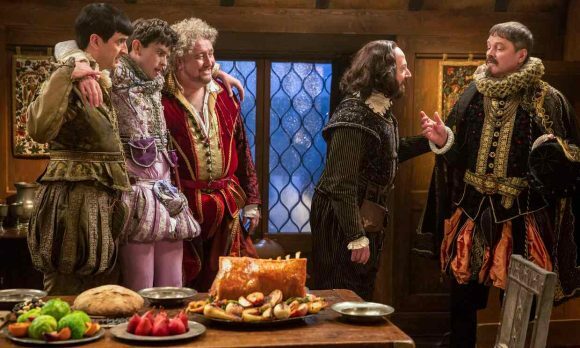 Its sitcom format feels lumbering and it has a complacent tendency to rely on [David] Mitchell’s waspish delivery of cod-Shakespearese.” — The Telegraph. “Methinks I’m bored with the Bard when ye gags are flogged to death … It’s as though Elton, the writer of brilliant Eighties sitcoms including Blackadder and The Young Ones, has forgotten a basic fact about jokes: they aren’t funny when you’ve heard them before. And a man who repeatedly trots out the same punchline is just a bore … David Mitchell works furiously to save the show from disaster.” — The Daily Mail.